If you have never ordered a subscription box for yourself, you are missing out. A subscription box like POPSUGAR’s Must Have box is like gifting yourself with a really awesome present that arrives at your doorstep each month. Each month is a complete surprise. You can keep the items for yourself or with the holidays coming up you could easily use the products from the POPSUGAR Must Have box as gifts. Of course, gifting someone with their very own subscription to POPSUGAR’s Must Have box is a pretty awesome gift idea all by itself. Henri Bendel- Packable Umbrella (Sugg. Retail- $58): This is such a gorgeous umbrella. It has brown stripes with solid pink detailing and compact enough to easily store in your car or bag for when bad weather strikes. LaLicious- Brown Sugar Vanilla Shower Oil and Bubble Bath (Sugg. Retail $28): talk about fall deliciousness. This shower oil and bubble bath smells warm and inviting just like Fall weather. I can definitely see myself enjoying a relaxing bubble bath using this after a long week. My Cup of Cocoa- Dark Drinking Chocolate (Sugg. Retail- $4.99): Speaking of warm and cozy, nothing beats a warm mug of hot chocolate on a chilly evening. I can not wait to try out this hot chocolate mix. I love that it is all-natural and contains no artificial flavorings. Morning Culture- Rise & Shine Diner Mug (Sugg. Retail $16): Of course, you need a super awesome mug to sip your hot chocolate from. I’ve been looking for cute mugs lately and this one has instantly become a favorite. I like the simplicity of the design and the overall look of the mug. I definitely found a new office companion with this one. Makeup Eraser- The Makeup Eraser Mini (Sugg. Retail $12): This is a must for any beauty lover out there. Instead of creating a lot of waste using disposable cleansing towelettes this reusable Makeup Eraser is capable of removing makeup after a long day with just water. Simply wet it with warm water and remove your makeup. This makeup eraser can be used over and over again and perfect for travel! Revlon Colorstay Liquid Eye Pen (Sugg. Retail $8.99)- With winged liner still all the rage I’m not surprised to see this liquid eyeliner pen in the box as a Must Have for October especially with Halloween this month. One can easily go from day to spooky with a few simple strokes. Power Your Happy- Work Hard, Play Nice & Build Your Dream Life by Lisa Sugar (Sugg. Retail $25): If you haven’t heard of Lisa Sugar’s, the founder of POPSUGAR , new book it’s one that you are going to want to put on your reading list. Packed full of advice this is a great read for Fall. Snag a Coupon Code for $5 OFF your First Box! Are you interested in trying the POPSUGAR Must Have box? Use the code SHOP5 at checkout and you will receive $5 off your first box! Head on over to POPSUGAR for more details like pricing plus how to sign up for next month’s Must Have box. 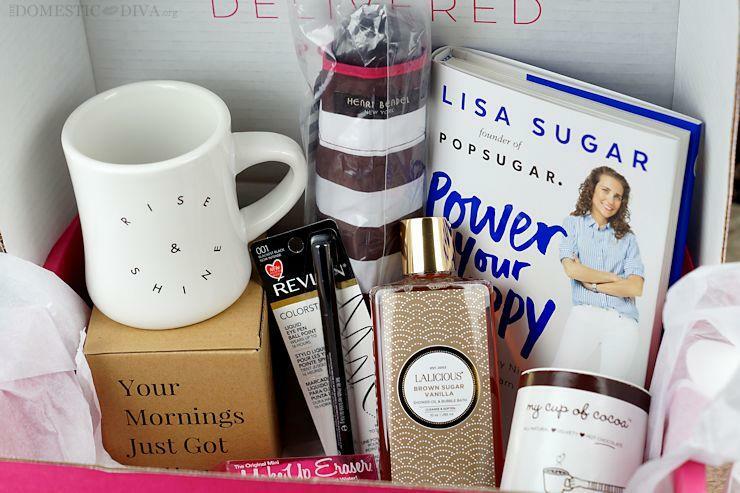 What is your favorite item in the POPSUGAR Must Have box this month? Want to know some other items that have been in previous POPSUGAR Must Have boxes? Check out this post. Disclosure: POPSUGAR sent me this Must Have Box to try out for myself. As always opinions are my own.